We live in a PowerPoint world, but despite Microsoft’s best efforts it’s not that easy to put together a professional looking slide deck with the powerful Office presentation app. The learning curve for more than a few slides with simple bullet points is simply too steep. But a free browser-based alternative called Haiku Deck does a credible job of empowering even novices to create slick presentations with a few mouse clicks. It does this with a wizard-like approach that presents you default slides and several options that you can try out by clicking them. Of course, you don’t get all of the features that make PowerPoint so powerful (no transition or audio effects, for example), but you don’t have to spend hours learning to use the software, either. Sharing your work is easy, too—Haiku Deck stores your presentations online (you must create an account to use it), but gives you loads of links for downloading them to social media sites and saving them as PDFs or PowerPoint files. A permissions feature lets you choose between making a deck public, sharing it only with people who get a link from you, or keeping it private. Haiku Deck may already be familiar to Apple iPad aficionados: Its iPad app has been around for about a year. But on the Web, it’s OS agnostic, based on HTML5. The two versions are pretty similar, although the web app lacks a feature or two available on the iPad. For example, on the iPad you can adjust the proportions in a pie chart by dragging and dropping the segments; on the web, you can only change the numbers themselves. However, if you work in the iPad app, you can save your changes and they’ll appear when you open your deck in the browser. Not the least of Haiku Deck’s charms is a tutorial in the form of a screen overlay that you see when you first launch the service. It has whiteboard-style annotations with arrows pointing to major features. Haiku Deck's tutorial is a charmer. The default starting slide is a title screen with dummy text for a heading and a dek (a subhead or brief summary paragrph). It’s the first of four text screen options you see by clicking on the Text icon in the left navigation bar (the other three are a bulleted list, a numbered list, and lines of plain text). Don’t let the nav bar intimidate you: It has only four icons—text, graphics, layout, and notes. Haiku Deck's default startign slide: Just add text. As with a Word template, you substitute your text for the dummy text by clicking on a field and typing. You can then change the look of the type by choosing one of the six included free themes, which dictate the fonts and their relative sizes. (Haiku Deck’s business model calls for adding additional themes you would pay for.) As you type, Haiku Deck automatically resizes the fonts so that your text fits the screen. The next order of business is adding a background graphic by clicking the graphic icon in the nav bar. This brings up options for images, charts, or solid colors. If you click on the image icon, you can either upload your own images, or let Haiku Deck find free stock art based on what you type in a search. Alternatively, you can opt for a solid background color. With the background in place, if you don’t like layout, clicking the layout icon brings up alternative positions for the text you chose earlier. You might want to separate the headline and the dek, or move them up or down, or align them left or right. Similar options are available for the other text types. You don’t, however, get layout options for the chart slides (under graphics). There are three (I expect Haiku Deck will charge for additional ones): a bar chart, a pie chart, and one with formatted and labeled numbers. You can add bars, pie chart segments, or numbers by simply clicking a plus icon on the slide. Haiku Deck offers three types of chart slides: bar, pie, and numbers. The notes icon brings up a field next to your slide for typing in anything you’d want your audience to know that doesn’t work well on the slide itself. These are not presenter notes, although those are in the works. You don’t have to use notes at all, obviously. On the top right of the Haiku Deck interface are the icons for sharing, exporting, and playing your presentations. 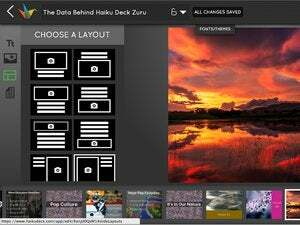 Haiku Deck automatically saves your work as you create it. The sharing options let you name your deck (so long as it isn’t designated as private under permissions), write a brief description, assign it to a category (useful if you choose to make it publicly available to all Haiku Deck users), and instantly post it to Facebook, Google+, LinkedIn, Pinterest, SlideShare, Twitter, or WordPress; you can also email a link, copy it, or generate HTML to embed on a website. Add important information that doesn't work on the slide to the Notes field. What a written description of Haiku Deck and its features doesn’t really convey is that it’s fun to play with. It’s a pleasure to see how easy it is to produce a reasonably attractive slide deck in only a matter of minutes, and the many sharing options really makes it a useful tool for people who want to create presentations with no training and a minimum of effort.